I'm happy to announce a collaborative effort between Lars Doucet (of Level Up Labs) and myself: the Procedural Death Jam! 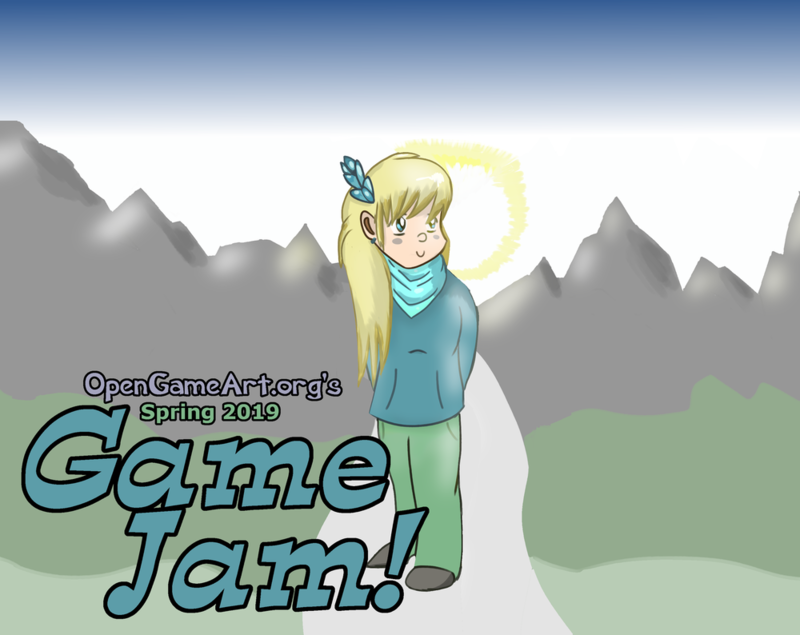 Procedural Death Jam is a 7-day game jam benefitting OpenGameArt’s recent Patreon campaign. The theme is "Procedural Death Labyrinth," a new way of describing games like FTL, Spelunky, Coin Crypt, The Binding of Isaac, etc, that’s less awkward than "Rogue-Like-LIKE" or "Rogue-LITE." You might have seen it trending on Steam Tags. The Procedural Death Jam (PDJ) starts on March 8th and runs for 7 days, which makes it concurrent with the 7-Day Roguelike Challenge, so if you're already planning on participating in that, you're free to enter your game in the Procedural Death Jam as well (note that this isn't necessarily true in reverse; while the term "Procedural Death Labrynth" encompasses the Roguelike genre, not all PDLs are roguelikes, so be sure to check their rules before you submit your PDJ entry to them). The PDJ is open to everyone. There are no restrictions on what game engines, toolkits, or libraries you use, and your game doesn't need to be open source. 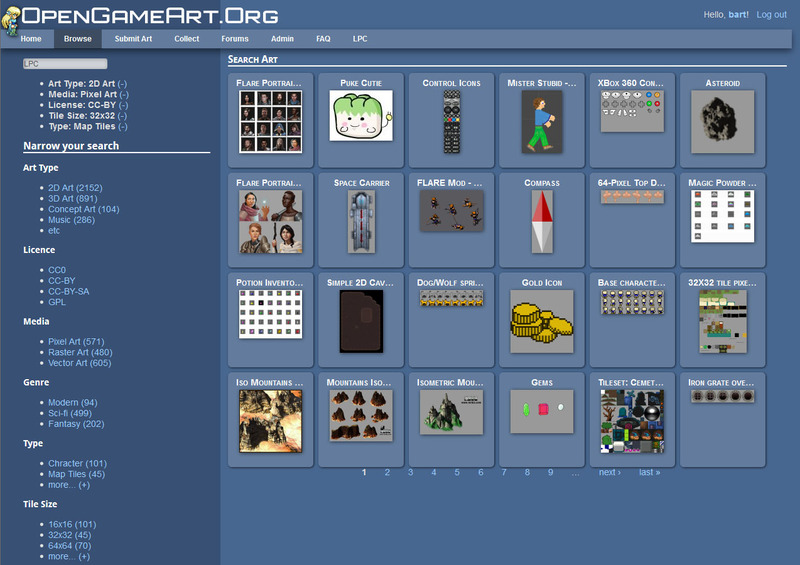 While participants are welcome and encouraged to use art assets from here on OGA, you're not required to. The only requirement about art is that it be legal (that is, you need to have the right to use it, so no ripped graphics or unlicensed IP). Contest participants vote on the winner(s) for each category. ...and as always, the cliched (but ever important) "Have fun!" We're looking forward to seeing what the community comes up with! P.S. Follow the PDJ on Twitter for updates. Edit: Now that we're over the $500 mark, this is our current goal. So, let's face it. Right now, OGA's art search feature isn't very good. The advanced search interface is cumbersome to work with, and sometimes search results that ought to be there just don't show up. For instance, one might think that if you typed the words "lpc base" in the search box, you'd find the LPC Base Assets, but in fact you actually get no results at all (or you might get a huge flood, YMMV). (FYI, the work-around in this case is to search for it again in the advanced search box on the left side of the search results, but even in that case, you get too many results, which still isn't particularly useful.) So, the other option is to browse by category, but the categories are so broad that that isn't particularly helpful either. This needs to be fixed. Right now, we use a Drupal module called Views to do art searches. I actually like Views a lot; it's great for quickly searching through and displaying lots of data, but frankly it's better suited to simpler types of searches. What I can do with the Advanced Search form, for instance, is currently limited by the capabilities of Views. I'd love to be able to automate some generation of metadata, but unfortunately, metadata is an inherently complicated thing. For instance, the metadata required for vector art is different from the metadata you'd need for pixel art. For pixel art map tiles, for instance, you probably want to know the per-tile resolution, but in the case of vector map tiles, resolution is irrelevant. For music, you might want to know the length and genre of the song. For 3D models, you probably want to know the polycount, texture resolution, whether it's rigged or static, etc. If we're smart, we can programmatically guess some of these things, but certain things, like musical genre, would require a much more sophisticated algorithm than we have processing power to run. So as I said, the solution to all this is that I'm going to have to go through and enter metadata as new art is submitted (not to mention going through the archives and adding it there too -- something that will likely take many, many hours). But before I even get to actually entering metadata, I need to figure out what is going to be the best way to store it, and then build a reasonably usable web form so that I can enter it without inducing any more headaches than absolutely necesssary. In the process of doing all this, I'd also like to rebuild the search interface into something that a) actually works, and b) is more appropriate for searching through art. Since this isn't implemented yet, you'll have to imagine that the results returned in the image are accurate and relevant, but that should give you a general idea of what we were thinking. And just to reiterate, this is a mockup, so it's subject to change. How long wiill this take? It's hard to say, but since it'll be such a huge change, I can say for certain that it's likely to take weeks of actual programming time (which could translate into several months out here in The Real World). Beyond that, new art isn't going to curate itself, which means that even after it's done, there will be a constant (and probably growing) workload of making sure that new art is properly curated. People have suggested gamification (that is, reputation points) to encourage people to help out, and I think that's an excellent idea, but when we eventually go that route, I'll have to put a lot of thought into ways to make sure that items aren't miscategorized or categorized inconsistently (a common problem if multiple people are sorting things into categories). Even if we enlist the help of users through reputation points, ultimately I'll still need to review their metadata for consistency. So, for those of you who have been wondering why the content curation goal (which everyone understandably wants) has been set so high, it's because it's going to require a huge initial time investment and then a fairly constant investment of time later on (on top of the few hours per week of basic site management and maintenance). If you have a Patreon account, you can now enter the link to your creator page in your user profile. A "Support [your name] on Patreon" button will appear on your user profile as well as all of your art submissions that you authored. I think the server speed issues are pretty much fixed now. The short version of the story is that there were about 10 different things wrong with the server. Some of those things were configuration issues, and some of them were database tables getting out of hand. We tweaked file system caching, we tweaked file system journaling, we tweaked the mariadb connection timeout, we tweaked mariadb memory allocation, we tweaked a couple Drupal modules, we fixed an out-of-control spam problem that was elsewhere on the server, and I'm sure we did some other things that I'm not remembering at the moment. Load average has gone from about 18 to a balmy 1.7. We'll see how things hold during peak hours, but right now things are looking a lot better. Again, sorry for all of the issues lately.